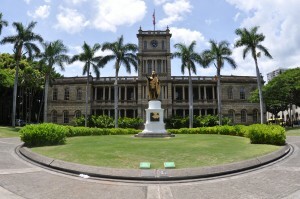 On May 9, 2012, the Hawaii Supreme Court ruled the state failed to adequately fund the Department of Hawaiian Home Lands (DHHL), and that beneficiaries can sue the state for sufficient administrative and operational funding. What is the Nelson v HHC case? The five-year battle challenged the state for failing to provide enough money to DHHL to carry out its mandate of returning Native Hawaiians to their land. Who brought on the case? The Native Hawaiian Legal Corporation represented six Native Hawaiians from Hawai‘i Island: Richard “Dickie” Nelson III, Kaliko Chun, James Akiona, Sr., Sherilyn Adams, Keli‘i “Skippy” Ioane, Jr., and Charles Aipia, who has since passed away. What does the ruling say (and what doesn’t it say)? The ruling says the State must provide DHHL with adequate funding, but does not specificy how much. The ruling only pertains to operational expenses and not the cost of developing land for homestead lots. How does the ruling affect DHHL? The ruling allows DHHL to request general funds to meet administrative expenses. DHHL stopped requesting general funds during the Lingle Administration in an effort to save the state money. This resulted in a heavy reliance on Trust funds and commercial lease revenue to administer DHHL. Why should I care about this ruling? As some of you may know, the $600 million court settlement from the early 1990s infuses DHHL with $30 million annually. But it is set to expire in 2014. As a result of this ruling, the availability of general funds to DHHL comes at a time when the department is diligently working to increase its revenue streams, to continue its mission of returning Native Hawaiians to the ‘āina.